Take a thrilling ride back in time on your ATV to La Cadelaria, a 200-year-old Indian village. 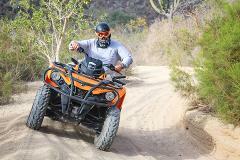 Enjoy this guided tour on our True Double Seat Independent Suspension luxury ATVs. Experience the thrill of driving the great trails used on the Baja 1000 race. This tour is a thrilling 5 hours long so buckle up for an adventure of a lifetime. ATV and Horseback riding tours on one excursion. 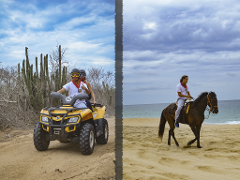 Come to explore Los Cabos; desert landscapes, sand dunes and mountains on an ATV and enjoy a beautiful ride on a horse along beach on the Pacific Ocean.